We learn in a new dimension. At the heart of our campus is the stunning Innovation, Science and Technology (IST) Building, home to some of the most advanced technology spaces in the country. Designed by world-renowned architect Dr. Santiago Calatrava, the IST is engineered for collaboration, research and education. Inside the IST Building are 26 classrooms and 11 Innovation Labs dedicated to researching topics like robotics, data visualization, 3D printing, big data analytics, cyber security, media production and entrepreneurship. The 11,000-square-foot Saddle Creek Logistics Commons houses the all-digital library, Academic Success Center and Technology Services desk. Classroom instruction is also facilitated by the latest interactive technologies and our student information systems keep students in constant contact with faculty, advisors, counselors and mentors on and off campus. At the intersection of creativity and STEM is inspired learning. Don’t just learn from textbooks, be inspired to solve today’s problems for future generations. Health informatics improves patient outcomes using applied science and advanced technology to collect, store and analyze medical data. Take health care into the digital age. Track down hackers, block virus attacks or plug security gaps in a fully functional network environment by playing 21st century games of cat and mouse. Hack or be hacked. Simulate real-world cyber security threats. Combine your creativity and computer skills to produce games that can be used in a range of industries while learning computer programming, animation and digital design. Game on. The Rapid Application Development (RAD) Makerspace is one of the largest in the nation. With 55 3D printers and scanners, the only limitation is your imagination. Learning is mandatory – having fun is optional. Have a brilliant idea? Take it to the Entrepreneurship Lab where technology and business blend to help students, faculty and industry partners bring their innovations to market. The IBM PureFlex System combines computing, storage and virtualization into a hybrid system optimized for cloud. This powerful supercomputer can process huge amounts of data in nanoseconds. Don’t blink. This lab blends the disciplines of robotics and programming. Be sure to keep your creations under control and program them using the Three Laws of Robotics to avoid a robot apocalypse. 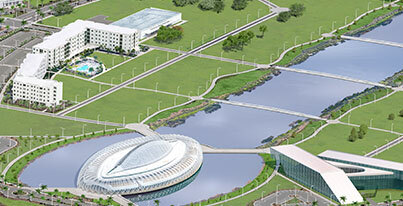 Technology permeates Florida Polytechnic University. From learning spaces to living areas, state-of-the-art equipment and applications keep students, faculty, staff and visitors connected. The University is a bring-your-own-device (BYOD) campus, so whether you’re Mac or PC, Android or iOS, desktop or tablet, Xbox or PlayStation, you can experience Florida Poly your way … or every way! 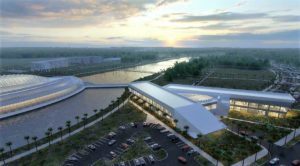 At Florida Polytechnic University, the Library is always open and classrooms aren’t confined to auditoriums. The University’s cloud-based network means that books, course assignments, lectures and notes are always accessible, whether you’re under the atrium of the Innovation, Science and Technology Building, lounging in the student residence hall, working out at the Wellness Center, reflecting by the pond or hanging out around town. Learning should be limitless. Get your head in the cloud.